Two gold rings, possibly used as earrings or to hold hair in place, have been found in Rosset, Wrexham, Wales. Archaeologists say the rings date back 3,000 years to the Bronze Age. The person who wore the rings was most likely wealthy or had status in the community in some other way, says ITV News. Archaeologists are uncertain whether the gold rings were used as earrings or to hold locks of hair in place. ‘Lock rings,’ as hair locks are called, have been found in Wales in Pembrokeshire, Conwy, Gaerwen, Newport, Anglesey and the Great Orme. ITV describes the concentric-ring pattern on the locks as a ‘coastal pattern’ that suggests trade and communication between Ireland and Wales. The Wrexham County Borough Museum and Archives will take possession of the pair of golden rings after they are valuated independently. 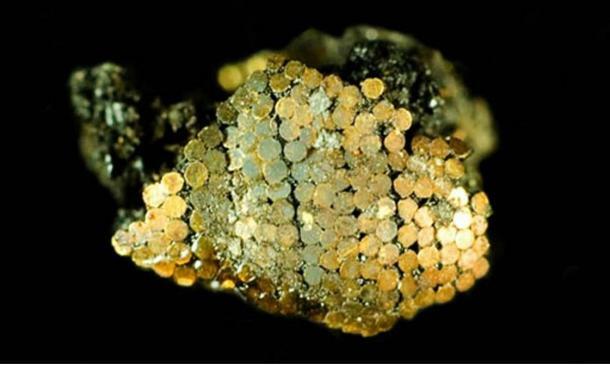 Wales has had other spectacular gold finds from the Bronze Age. The Mold Cape is a 3,700-year-old solid gold artifact found in the 19th century within a Bronze Age burial mound at Mold, in Flintshire, Wales. It was finely crafted out of a single sheet of gold, then embellished with exceptional decoration designed to mimic multiple strings of beads amid folds of cloth. 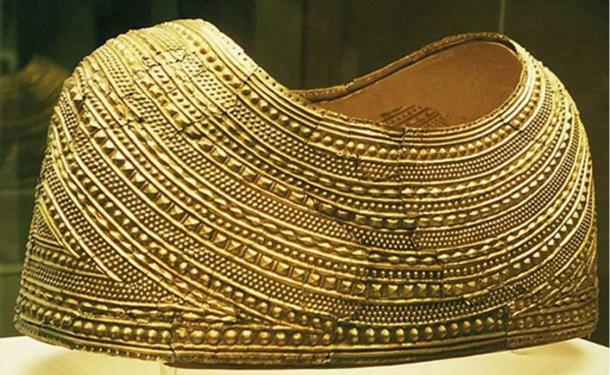 The cape is regarded as one of the finest examples of prehistoric sheet-gold working in Europe and perhaps the world. Its unique form and design demonstrates highly advanced craftsmanship in Bronze Age Europe. The Bronze Age burial mound was found in a field named Bryn yr Ellyllon (Fairies’ Hill) by workmen in 1833. It had been placed on the body of a person who was interred inside a cist (stone-lined grave) within a burial mound. Inside the mound, archaeologists also found the remains of woven textile, 16 fragments of sheet bronze, a bronze knife, fragments of a second gold cape, two gold ‘straps’, an urn with large quantities of burnt bone and ash, and the remains of hundreds of amber beads, which would have originally been on the cape. Archaeologists and scholars were stunned. At the time and place this gold cape was made, people in Britain lived in temporary settlements and fluid communities, and they moved with their livestock and possessions through the landscape. They did not build cities or palaces, yet they were capable of creating incredibly sophisticated objects like the Mold Gold Cape. Not far away, in England, archaeologists recently explained how intricate gold pieces like those found at Stonehenge could be fashioned by people with relatively crude technology. One piece alone was estimated to have taken 2,500 hours to complete. These pieces from near Stonehenge used a different gold-smithing process than the Welsh pieces. In 1808, William Cunnington, one of Britain’s earliest professional archaeologists, discovered what has become known as the crown jewels of the King of Stonehenge. They were found within a large Bronze Age burial mound just a short distance from Stonehenge, known today as Bush Barrow. Within the 4,000-year-old barrow, Cunnington found ornate jewelery, a gold lozenge that fastened the owner’s cloak, and an intricately decorated dagger. A report in The Independent explained the amazing process involved in creating the handle of just one dagger, adorned with up to 140,000 tiny gold studs just a third of a millimetre wide. The first stage involved manufacturing extremely fine gold wire, just a little thicker than a human hair. The end of the wire was then flattened to create a stud-head, and was then cut with a very sharp flint or obsidian razor, just a millimetre below the head. This delicate procedure was then repeated literarily tens of thousands of times.